These Keto No-Bake Cookies only require a few simple ingredients and are incredibly easy to make. 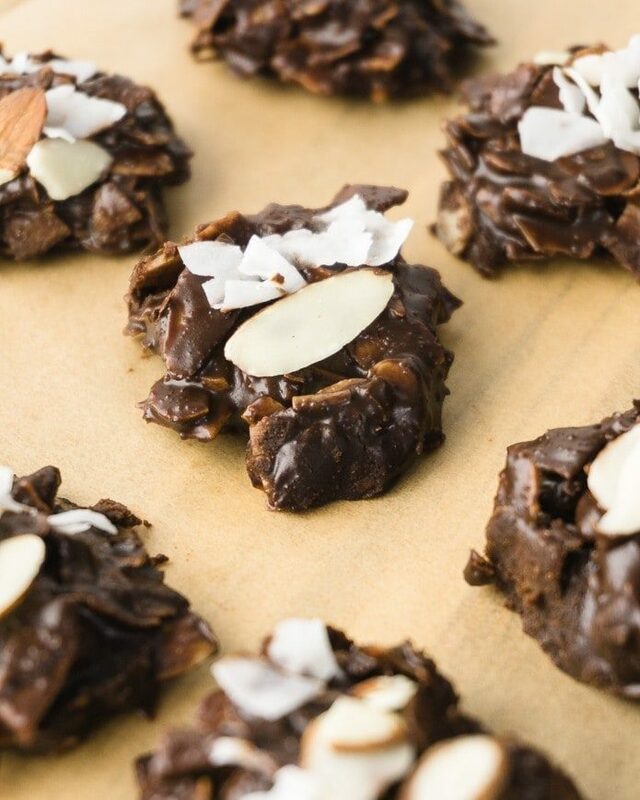 Made with cocoa, almonds, and coconut, these cookies are perfect for a quick keto dessert. No need to turn on the oven to enjoy these keto cookies! No-bake cookies are one of those recipes that my family pulls out every year around the holidays. They are a Christmas tradition. 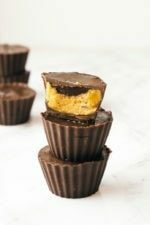 They have a yummy, fudgy texture and are packed with crunchy mix-ins. 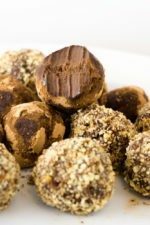 This keto version is my attempt to recreate the classic no-bake cookies that everyone knows and loves. 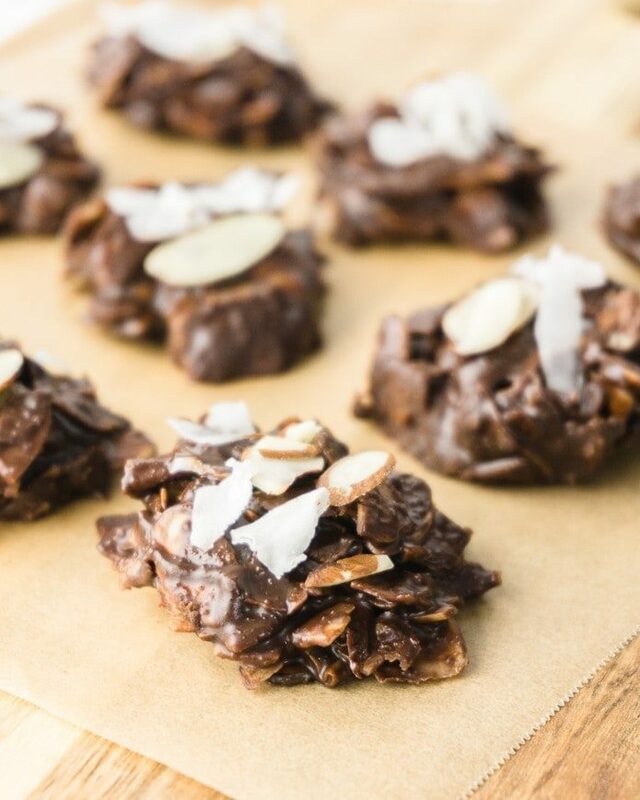 With the flavors of chocolate, almonds, and coconut, these Keto cookies are like upgraded Almond Joys! 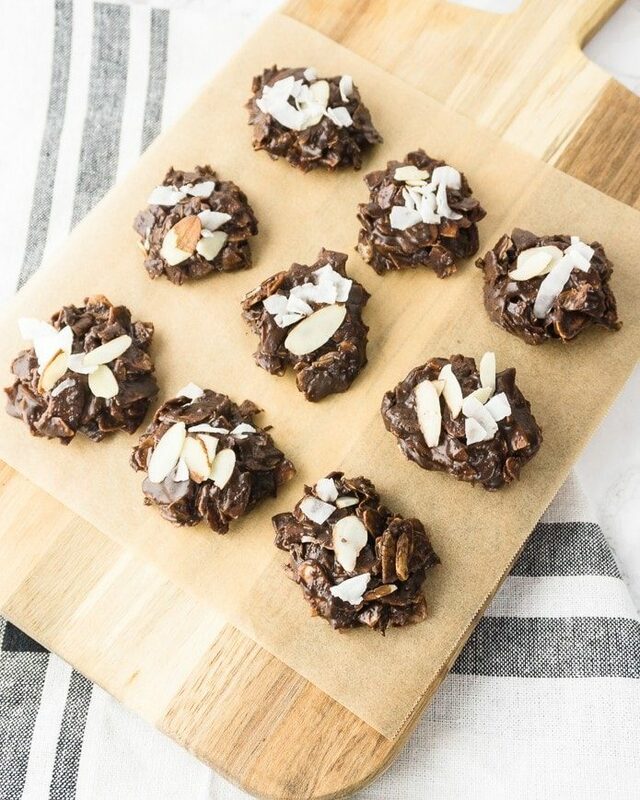 Traditional no-bake cookies are made from peanut butter, lots of sugar, and either oats or another cereal. So, to make these no-bake cookies keto-friendly, I had to make some substitutions. These keto no-bake cookies start out with a base of melted butter and almond butter. 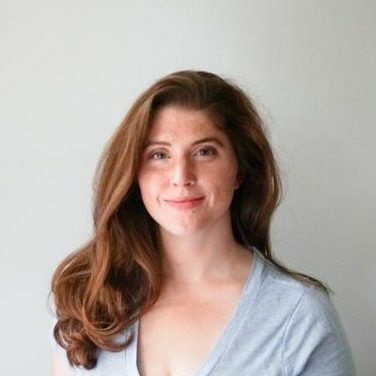 I chose an almond butter with no-added sugar to complement the flavor of the sliced almonds I added— but you can certainly substitute peanut butter or any other nut butter than you like. Then, I added a couple tablespoons of cocoa powder and powdered erythritol sweetener. 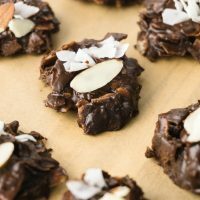 Either natural cocoa or Dutch cocoa can be used to make these keto cookies. Dutch cocoa powder is cocoa powder that’s been alkalized to make it less acidic and give it a mellower flavor. If you want the flavor to be super dark and earthy, use Dutch cocoa. If you want the flavor to be a bit lighter or fruity, use a natural cocoa powder. Since the cocoa powder is the main flavoring ingredient in these cookies, don’t be afraid to splurge on something high quality. I love this premium natural cocoa powder. 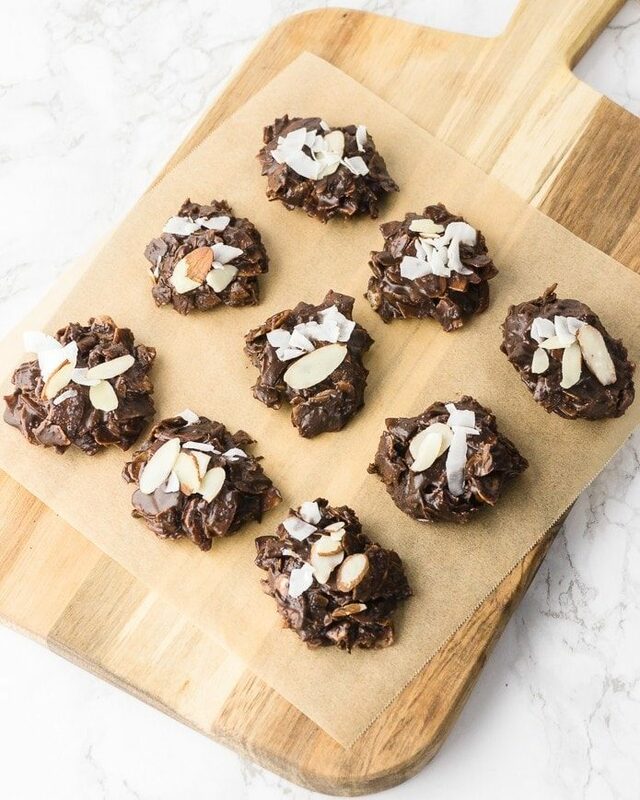 A drop of vanilla and a pinch of salt round out the flavors of chocolate and almond in keto no-bake cookies. For the crunchy mix-ins, I chose sliced almonds and coconut chips. Coconut chips are larger prices of unsweetened dried coconut. I like the crunchy texture of the coconut chips in this recipe. If you wanted a chewier texture, you could go with the smaller-size desiccated coconut. 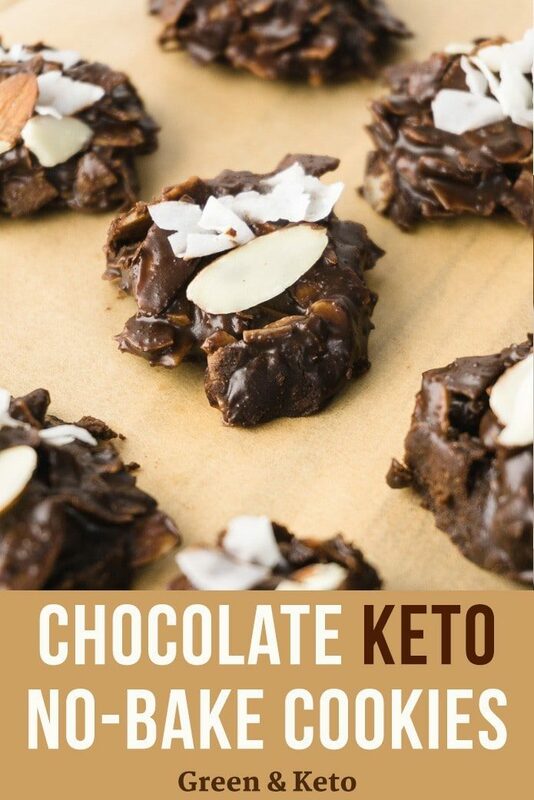 Either the coconut chips or the desiccated coconut would make a delicious keto no-bake cookie. And, for an extra boost of flavor, try toasting the almonds and coconut before mixing them into the cookie batter. To toast the almonds and coconut, spread the almonds and coconut flakes on a baking sheet in a thin layer and bake in preheated 325° oven. The almonds and coconut will toast very quickly — only 5-10 minutes. Is almond butter healthier than peanut butter? Almond butter and peanut butter have similar nutritional values. You could say that almond butter is slightly healthier than peanut butter because it has more vitamins, minerals, and fiber. But depending on what brands you choose, both nut butters are roughly equal in calories, fat, carbs, and protein. For example, Barney Almond Butter (no sugar added) has 16g fat, 7g total carbs, 4g fiber, 3 net carbs, and 7g protein. Spread the Love Organic Peanut Butter (no sugar added) has 15g fat, 6g total carbs, 2g fiber, 4 net carbs, and 7g protein. 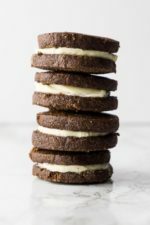 If you love chocolate, I think you’ll also like my Two Ingredient Keto Truffles, these Keto “Oreos” Chocolate Cookies, or a cup of Creamy Keto Hot Chocolate! These no-bake cookies have a soft fudgy texture at room temperature — they don’t set up and get crunchy like other types of baked cookies. If your kitchen is relatively cool, you can store them in a sealed container on the counter. However, if your kitchen is on the warmer side, they may get a bit melty. So in general, I recommend keeping them in a sealed plastic container in the fridge, just to make sure they don’t get too soft. For long-term storage, you can keep them sealed in the freezer. 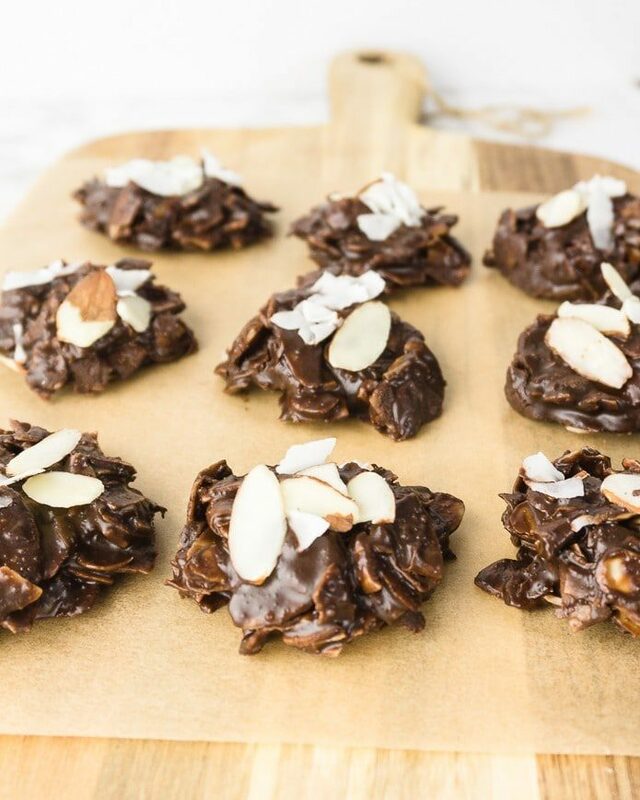 Yep, you can even make these keto no-bake cookies in the microwave. In a large, microwave-safe bowl, melt together the butter and almond butter. I like to do this in short bursts of 30 seconds, stirring in between. After the butter is melted, add the sweetener, cocoa powder, salt, and vanilla. Stir together to combine, and then fold in the coconut chips and the sliced almonds. Scoop tablespoon-sized portions of batter onto a parchment paper lined cookie sheet, and let the cookies set up. If your cookies are still too soft at room temperature, that’s okay. Just pop them into the fridge to harden. In a saucepan over medium heat, melt together the butter and almond butter. Stir in the sweetener, cocoa, vanilla, and salt. Whisk to combine. Spoon tablespoon-sized portions of the batter onto a parchment-lined cookie sheet. In a microwave-safe bowl, melt together the butter and almond butter in bursts of 30 seconds. Stir between bursts to prevent scorching. If your cookies don't set up at room temperature, you may need to chill them in the fridge. Each cookies has 147 cals, 14g fat, 5g total carb, 3g fiber, 2g net carb, and 4g protein. The nutrition information is provided as a courtesy and is approximate only. It was calculated via My Fitness Pal with the recommended brands and ingredients. All brands are different, so please verify the macros with your specific ingredients to ensure accuracy. Erythritol carbs are not included in carb counts as it has been shown not to impact blood sugar.